View our full range of double oven gloves and gauntlets so you can choose the one that's right for you. All items feature a flexible terry cotton layer behind which is an entirely impermeable steam and grease barrier for the ultimate protection. 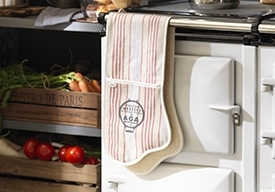 Our gauntlets are extra long so you can reach into the AGA ovens safe in the knowledge that you are protected and our double oven gloves are 93cm in length for handling large tins and trays. Both have an ergonomic shape for easier grip and confirm to BS 6526:1998.